At the moment, I'm mainly letting ideas brew at the moment. EagleCeres has some good ideas for the characterization in this post. Let's go with 'one of Su's inventions summons the Chibis' idea. Now comes the question of when they appear. If it's after Keitaro appears, the question then becomes when? Now for the info on the chibis. Information is subject to change. Names are subject to change until they've been finalized. So feel free to suggest anything that might either be a good character trait, name, or possible storyline. I thank EagleCeres for brainstorming most of the character traits and possible names. Chibis that I'm not too sure I'll use :Chibi Sarah, Chibi Kanako and A chibi of Tsuruko's husband. Possible character traits : Inventor. Tends to focus on Su's old inventions and improving them. Possible character traits : mostly flies on Tama, has an ability to eat the innards of watermelons without cutting them open and then teleporting inside to pop out the shells like they were egg shells. Possible names :Kei-kun, Kei-chan, Kei-sama, Kei-dono, KeiKei. Possible character traits : Tends to assist Shinobu with cooking. gives off a confused/absentminded look most of the time. Tends to be treated like a plushy by Shinobu and Su. If we go for after Keitaro appears, we'd want to put it closer to when Mutsumi becomes a semi-regular fixture to the group. 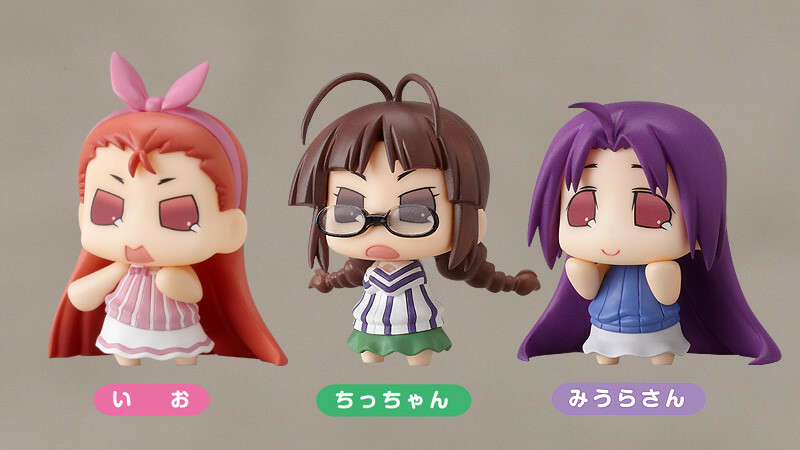 That can ensure the maximum amount of chibi versions of the girls. Maybe even a Chibi-Haruka and Chibi-Keitaro. We don't want to put it during the whole Kanako incident, as then we'd have Seta 2.0 dealing with a Chibi-Kanako stalker. Since many of us don't like the Seta 2.0 change for Keitaro, it just makes sense to have it when Keitaro is still a bumbling goof that isn't a kung fu master. I don't like Seta 2.0 either. He seems a bit too much of a stepford smiler to me. Keitaro appears, asks Haruka for help with a problem, but unwittingly calls her aunt. Haruka tries to strike Keitaro, But Chibi-Haruka blocks the attack. Haruka tells Chibi-Haruka to stay out of it. Chibi-Haruka goads Haruka into a bit of a slap-fight by calling Haruka 'old lady'. The two fight while Keitaro gets ignored long enough that Haruka forgets that Keitaro called her 'aunt', but not long enough to forget that he came to her asking for help. As for Chibi-Keitaro, I kinda see the girls expecting Chibi-Keitaro to somehow get the Chibi-Girls to act like like their regular-sized counterparts when he gets into accidents with them, but all the chibi-girls do is hug/snuggle Chibi-Keitaro and don't seem to mind sharing him. And here's the potential scene that kind of explains it. "Chibi-me, why aren't you hitting the tiny pervert into the sky when you find him doing something perverted with the other chibi-girls?" Naru asks in an angry huff. "Heh... First off, I and the other chibi-gils listen to what the mini-landlord says. Second. your ideas and expectations of what a relationship are is not what my ideas and expectations of what a relationship are," Chibi-Naru explains with a smile. Raising an eyebrow, she asks, "Or is it that you're jealous of little old me?" Chibi-Keitaro was on top of a bookcase, trying to find an old cookbook that Shinobu was looking for. He suspected that it might have merely been placed where it couldn't normally be seen. As he rummaged through the books that had been placed on top, Naru stomped into the room, grumbling about leering perverts on the train. Getting a feeling that she was being watched, Naru looked around. When she looked up, she spotted Chibi-Keitaro, looking away and seemingly trying to hide behind a blockade of books. Naru narrowed her eyes in anger as she grabbed a stepladder. After placing it down at the bookcase, she climbed up and then grabbed Chibi-Keitaro. "What gives you the right to hide and stare down my shirt, you sick little pervert?!" Naru yelled as she shook Chibi-Keitaro, who was getting scared and was getting ready to cry. "You put him down gently, or we'll take you down..." A voice said in a cold and angry tone. Naru got a feeling that she was in danger. She looked around and her anger vanished as she saw that she was surrounded by Old Tamabots. She looked down and saw that the Chibi-girls were around the stepladder. Each of them was angry. Chibi-Motoko had a hand on her mini-bokken, ready to strike at a moment's notice. Chibi-Kitsune was holding a full beer bottle as if it were a bat. Chibi-Su was holding a remote control. Chibi-Shinobu was holding two metal pans and almost seemed like she was about to cry, but her eyes were burning with fury. Chibi-Sarah and Chibi-Haruka almost seemed like they were disinterested, but their eyes kept looking at Naru, as if they were waiting for the perfect time to strike. Chibi-Naru was cracking her knuckles. Realizing that she was in serious trouble, Naru held Chibi-Keitaro close to her in a hug and was gently rubbing the top of his head. "Y-You're misunderstanding the situation! Can't we talk this over?" Naru quickly asked as she was trying to hold onto Chibi-Keitaro, who was trying to get away from her. Naru knew that if Chibi-Keitaro got away from her now, there was a very good chance that the other Chibis would attack her. Dunno if I would use this in the fic, but this scene kept coming to my head over and over again. I still think the 'Chibi-Motoko in Keitaro's shirt' Scene is far superior and fits with the intention of the fic being a funny and heartwarming one, and I only wrote the general idea of that scene. So I might not use this little snippet until I can re-write it to fit. - Is everyone supposed to have a Chibi? Or should it be limited to the ladies? - Does each Chibi like to be called Chibi-name or do they get/enforce a nickname in reference to their original (examples: Harurun for Haruka's, Toko-san for Motoko's, Lala-sama for Kaolla's, Kon-chan for Kitsune's... etc) ? - Chibi Haruka? just as pokerfaced as the original but more actively interested/worried for her nephew? - Do the Chibis idealize (see no wrong in) Kei or do they just let his klutz-spasms slide because they just trust their feelings about him? - in reference to the Kyoto Trip, where Kei bound himself like a burrito... do the Chibis (or at least Naru's) know he's that chivalrous? - Chibi Mutsumi... the real turtle princess, even Tama-chan gives her rides! I'd be happy to answer your questions, EagleCeres. 1.) At first, it was only the ladies getting Chibi counterparts, but I'm going to experiment with the idea of Chibi-Keitaro. At the moment, his planned role is probably acting like a little brother to Keitaro. But if Chibi-Keitaro doesn't do well in the planning stages or the rough drafts, I'll drop the character. 2.) For the preplanning stages and the rough drafts, I'm using the Chibi-names. When I get to work on the fic for real, I'll go with nicknames, but I'll let it be up to this board to decide them. 3.) The chibi's nickname for Keitaro would probably be different for each chibi. 4.) You pretty much described what I intended for her personality. 5.) Pretty much the second one. 6.) Yes. And is it wrong that I'm imagining that Chibi-Naru decides to tie up Naru, just like Keitaro tied himself up? Probably. 7.) I didn't even think of that. It is a very adorable image. 8.) Yeah, that is a better idea and it fits them so well. Right now I'm imagining Chibi-Mutsumi riding Tama-chan while leading the rest of the Chibi girls to a mass cuddle fest with Keitaro. Meanwhile, Chibi-Keitaro is being a plushy for Shinobu. One idea I've been thinking over is the inclusion of Chibi-Kanako. Should she appear in the Love hina universe along with the others, but quickly hides until I can think of a spot to introduce her? Or have Chibi-Kanako appear either when Kanako appears? Perhaps I should have Keitaro discover her when he goes on the trip with Seta and Chibi-Kanako prevents him from becoming Seta 2.0 by crying whenever he shows signs of it? Anyways, here's something I briefly scribbled together. Su wiped her forehead as she finished her newest invention. The invention had a large keyboard and various monitors, built into a metal desk. It resembled the control station object from the game 'Evil Genius', a game Su recently played. "I'll call it 'The Spymaster machine'! Now I won't need to use any turtle spybots! I can simply use this to watch across amount of space to watch eveybody!" Su cheered as she turned on her newest invention. Su's spymaster machine started to whine, sparkle and show various images in its screens, none of which was making any sense to Su. Some showed Keitaro marrying one of the girls. Some showed them all in a relationship together. Some showed Keitaro and and what looked like an older Motoko together, But Su noticed that every so often, the Motoko in the image had a different face, as if Motoko had a sister. Another set of images showed Keitaro, but as a girl. When the screens began to flicker and the sparkling got worse, Su began to back away, never noticing that the screens now kept showing chibi versions of the Hinata group over and over again. su barely managed to get to a barrier and hid behind it before the Spymaster machine blew up. After a few seconds, Su started to peek out from her hiding spot. In the smoke, were eight outlines. Though Su could have sworn that there was a ninth for a brief moment. When the smoke finally dispersed, Su was shocked to see chibi-versions of Herself, Motoko, Shinobu, Mutsumi, Naru, Sarah, Haruka, and Keitaro. For the part where it shows various images, a part of me kinda wants to go around and ask some authors if I can make a very brief reference to their fics. For some reason, I just got this image of Tsuruko meeting the Chibis, then looking over at Motoko, and asking, "Where's mine?" That or Chibi-Motoko goes even more defensive/possessive and pounce-glomps the big Kei. While surfing the web, I found "Toaru Majutsu no Indekchu". It's a cute doujin of 'A Certain Magical Index'. 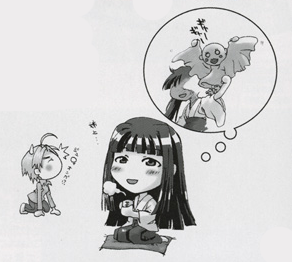 In the doujin, Index is a chibi most of the time unless she touches Touma's right hand. When that happens, she becomes her normal self, until she stops touching his right hand. But what I kept coming up with wasn't warm and fluffy at all. Kitsune, Su, and Sarah are largely unaffected by being Chibi most of the time. Motoko, Naru, and Shinobu are really bothered by it. Motoko is prevented from competing in her Kendo club by her fangirls and winds up getting stuck as a cute mascot for the club. Naru and Shinobu pretty much get the same problem, large groups of fans that won't give them any peace or respect. While that storyidea does make for an interesting fic in my eyes, I'm going to stick with the 'Chibis are separate beings from their normal-sized counterparts' idea. I am aiming for a warm and fluffy fic, after all. While I do realize that the fic won't be warm and fluffy all the time, I just hope that most chapters end with the readers walking away and thinking, 'That brightened up my day a little bit'. I just have to make sure that the fic never reaches glurge levels. One possibly planned chapter is Shinobu is out shopping with some of the chibis when she or one of them notice that there is a growing number of crows. Once it reaches 'Alfred Hitchcock's the birds' level, the crows try to attack Shinobu and the chibis'. but Chibi-Su shows up with an army of Tamabots to save the day. Why are you making this a Naruto crossover? I'm not. Crow attacks are a real problem in Japan. How should the Chibis look? I dunno about you guys, but I prefer the first one over the second. Less nightmareish in my opinion. I agree with you, so I think I'll use the Puchimasu style. I also think I'll use a picture of Miurasan of when she was found in the pyramid in the manga, since she kinda looks like Mutsumi. I also updated the first post with info about the Chibis. Any info is subject to change, however. Also, should I have the Chibis be able to speak like Keitaro and the others, or like the Puchidols? Have them speak like Keitaro and the others, but perhaps with a few quirks. Given that I know nothing on Puchimasu or the Puchidols, I'd get lost otherwise. The Puchidols tend to speak one or two words, kinda like pokemon. True, it might be cute, but it can get irritating if done wrong. On the other hand, it does allow the reader to insert whatever they want into whatever the character says. Yeah, but that won't necessarily work with some of the initial concept prompts that've been put up. Let alone Chibi-Kitsune spouting wisdom between shots of sake. If anything, you could take a page from the summons in BakaTest. Where the cast's "summoned beasts" are basically cute super deformed versions of themselves that are way more honest (and/or blunt) about things. Although they tend to speak more like little kids. No offense or anything, but why is this in the previews section, instead of Ideas? I was going to argue, but you do bring up a good point. So I'm going to go write the first chapter and put it up by tonight or tomorrow, so this topic can stay here. Due to some problems, I don't think I'll be able to write the chapter any time soon. Any mods reading this, could you please move this topic to the Ideas section? I learned that Chibis are better off being seen. Writing takes something out of it. also, the names and personalities of the Chibis are still undecided. I'm leaving it up to you guys to decide on their names and personalities. Should I leave KeiKei's speaking as is or change it?